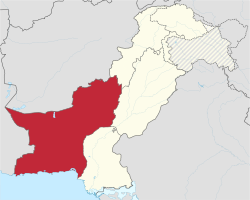 Balochistan (Balochi, Pashto, ಉರ್ದು: بلوچِستانبلوچِستان, BalōčistānBalōčistān, pronounced [bəloːt͡ʃɪst̪ɑːn]), is one of the four provinces of Pakistan, forming the southwestern region of the country. Its provincial capital and largest city is Quetta. It has borders with Punjab and the Federally Administered Tribal Areas to the northeast, Sindh to the east and southeast, the Arabian Sea to the south, Iran to the west and Afghanistan to the north and northwest. The main ethnic groups in the province are the Baloch people and the Pashtuns, who constitute 46% and 42% of the population respectively according to the preliminary 2011 census; the remaining 12% comprises smaller communities of Brahui, Hazaras, Sindhis, Punjabis and other settlers such as the Uzbeks and Turkmens. The name Balochistan means "the land of the Baloch" in many regional languages. Largely underdeveloped, its provincial economy is dominated by natural resources, especially its natural gas fields estimated to have sufficient capacity to supply Pakistan's demands over the medium to long term. Aside from Quetta, a further area of major economic importance is Gwadar Port on the Arabian Sea. ↑ Lakdawalla, Muhammad (April 5, 2012). "The tricky demographics of Balochistan". Dawn News. Retrieved May 16, 2017. ಈ ಪುಟವನ್ನು ೧೬ ಜನವರಿ ೨೦೧೯, ೧೧:೨೨ ರಂದು ಕೊನೆಯಾಗಿ ಸಂಪಾದಿಸಲಾಯಿತು.